Every day is a good day to sparkle! 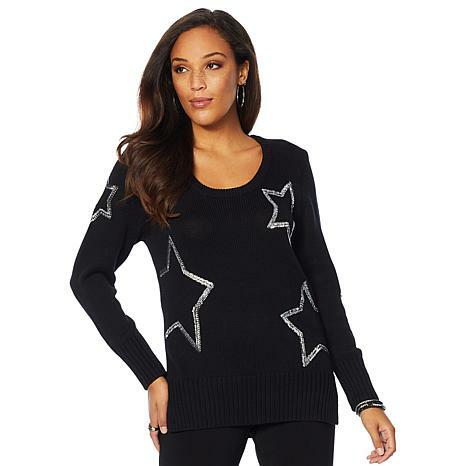 Be a style star whenever you wear this sequined star knit sweater from Antthony. Showstopper and conversation piece.Please make in other colors- Antthony!Great job fits a 5 foot girl great. I wore this new years eve and got compliments from complete strangers. It is beautiful. Thank you Anthony. This sweater is made very well. It's not too thin or too heavy. The stars are made on the sweater great. The length is great. I wore it with my nice dress leggings and black boots and it looked great on me. I'm a bling lady and the stars have just enough bling. A soft, comfortable jersey knit body mixes perfectly with gorgeous, dramatic embroidered mesh bell sleeves in this wear anywhere number. 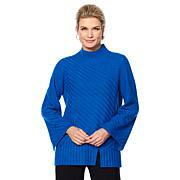 The tunic length gives it a flattering silhouette and it features an easy fit for effortless everyday style. Fashion meets floral in this comfy, soft jersey knit sweater. It features a mesh overlay with a floral embroidered motif that appears to grow from the hem border up for the perfect combination of everyday wear and eye-catching flare.